While eth’s price fell for much of last year, forced closure of Collateralized Debt Positions (CDPs) counter-balanced dai sell-pressure. Now that eth’s price is rising, questions have been raised on whether it can keep the peg. It hasn’t quite been able to do so for some time, at points falling to as low as $0.96 on Coinmarketcap which somewhat distorts the average by the inclusion of exchanges with fake volumes. So a new tool is out by MakerDAO devs (pictured above). Last 50 days of $DAI vs $USD from several DEXs from Lev at @MakerDAO Spikes tend to correlate to CDP liquidations as keepers rush to get $DAI and cover debt. The big story is $DAI is consistently trading lower than 1 $USD. There were two interest rate increases of 0.5% last month. That combined additional 1%, however, wasn’t having much of an effect. That’s because the main use-case for dai has turned out to be decentralized and open margin trading. That is you lock say 10 eth, get 1,000 dai, then you buy with it 5 eth. 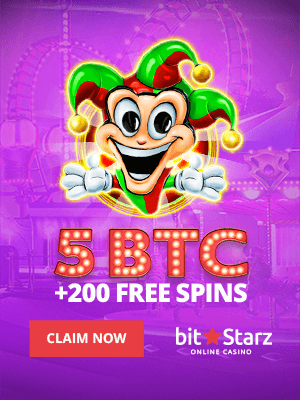 Now you lock the 5 eth, get 500 dai, and repeat. Obviously you risk getting called and losing it all, which is the primary concern for traders. A 1% yearly interest rate, by comparison, is kind of not at all a consideration. Dai off the peg, March 2019. “An examination of the available data strongly suggests a Stability Fee increase is warranted. The exchange price of Dai across several major exchanges, such as Coinbase Pro and Bitfinex, has been consistently hovering in the $0.975 to $0.985 range for 1-2 months. Decentralized exchanges with sufficient volume/liquidity, such as Eth2Dai, also confirm the same discrepancy. Informal discussions with several large Dai market makers have suggested that inventory levels have run high, and balance sheet capacity has diminished. Informal polling through various community channels has also shown strong support for an increase. 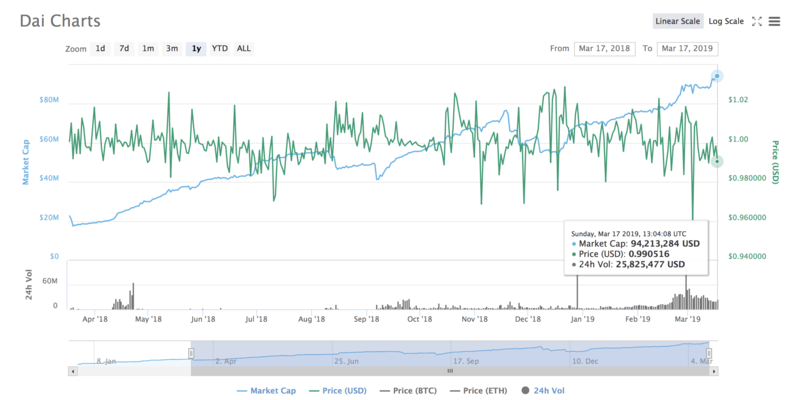 Dai price and market cap, March 2019. “When the Dai price is below the peg, CDP users with outstanding Dai may be able to profit through repaying their Dai debts cheaply. Anyone who issued Dai when it was at the peg (and then sold their Dai for ≈$1 in other assets) will be able to buy Dai at the market price and repay their debts for less than they received by selling the loaned Dai in the first place. Since the market price is below the pegged price, they get a discount and thus profit, as long as the discount is larger than the transaction fees and accumulated interest on their Dai debt. 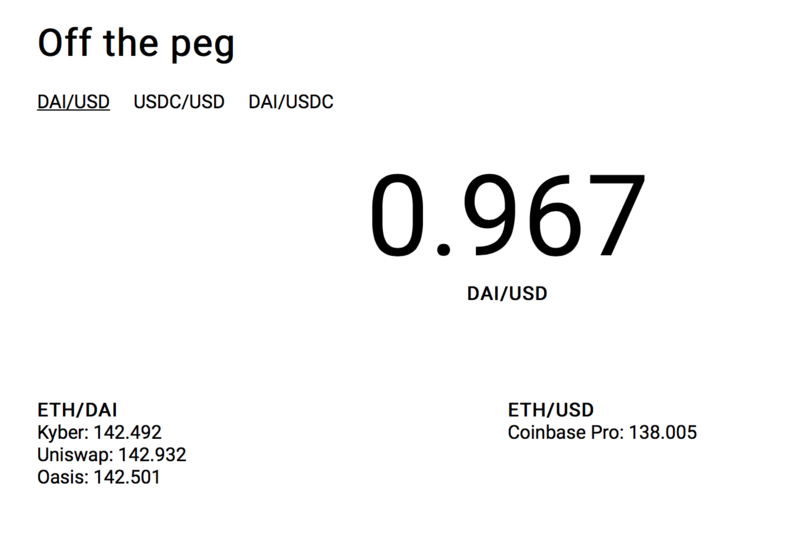 Note that this trade does not exactly depend on the Dai market price being below the peg. It depends on the market price being below the Dai price from when you originally issued your Dai. So you can make this trade and profit whenever Dai drops. This means that this mechanism doesn’t just incentivize CDP users to buy back Dai when the Dai is below the peg; it incentivizes buying back Dai whenever the Dai price is below the price it was when you issued Dai. Instead of creating demand for Dai at the peg, which would help it stabilize towards the peg, this mechanism creates demand at a cloud of different values around the peg, at the values at which users opened their CDPs and issued Dai. “Early on, the Maker team might stabilize Dai through off-chain funds. As the MKR token currently has a much larger market cap than Dai, they can sell off MKR tokens to generate off-chain reserves larger than Dai’s entire market cap. The team can then use the reserves to stabilize Dai in various ways. “A person who holds Dai can lock and unlock Dai into a DSR contract at any time. Once locked into the DSR contract, Dai continuously accrues, based on a global system variable called the DSR. There are no restrictions or fees for using DSR other than the gas required for locking and unlocking. For example: If the DSR is 2%, a user who locks 100 Dai into DSR mode, and keeps it locked for a full year, would earn two additional Dai which will automatically be added to their wallet when the Dai is unlocked. Anyone can ‘lock’ their Dai into DSR mode using a simple UI. Such return on investment would presumably increase demand for dai, thus counterbalancing any selling pressure from leveregers or individuals who use it as a plain loan, but to do so convert dai into USD. He couldn’t provide an estimate of when MCD will launch, but even without such savings rate, the peg has held fairly well, but of course if that is due to MKR’s bots, then it is sort of cheating, which is perhaps to be expected at this very early stage. Such bot peg would also limit capacity because there’s only so much MKR funds that can be utilized for that purpose. With a savings rate, however, this might perhaps be able to scale, but naturally the system will have to go slowly with a supply limit of 100 million dai now close to being reached. They’ll have to decide whether to increase it, just as they’ll have to decide whether to increase the stability fee further.